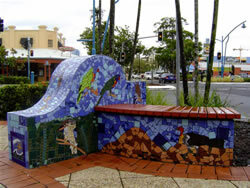 Shardworks Mosaic Studio is located adjacent to the city centre of Cairns and is filled with colour and an eclectic range of mosaics. Dominic Johns, owner of Shardworks, has over 20 years experience in working with glass and ceramic and combines artistic talent and knowledge of products and installation that ensure any mosaic work will last the test of time. Etruscan murals, Moroccan door lintels, tables, designer bench tops, sculptural pieces, garden art, exotic swimming pools, commercial signage, beautiful unique bathrooms and kitchens – no project is too challenging! Shardworks can design mosaics to any concept or create a mosaic to a design created by you. Regular workshops and classes are held and tools and tiles may be purchased from the showroom at the Shardworks Studio. Come in and see the largest range of colored tiles in Queensland.